The city of Göttingen in Lower Saxony has been the location of the Handel Festival since 1920. Its August-Georg Universität, 275 this year, was founded by the then Elector of Hanover, England’s George II, in 1737. The university helps facilitate the annual Handel festival. The two-week festival ending on Whit Monday offers musical events, the highlight being several performances of a fully staged Handel opera, lectures and Handel-oriented activities for young and old. Last year Nicholas McGegan rounded off his twenty years as music director and conductor, being awarded the Medal of Honour of the city and was succeeded by Laurence Cummings, the motto of whose first programme was Love and Jealousy. It featured many concerts, two oratorios, Esther and Solomon, a semi-staged Aci, Galatea e Polifemo and the opera Amadigi di Gaula. As seventeenth- and eighteenth-century music theatre scholars, always hoping for a historically informed production, our main reason for attending the festival was Amadigi. It was performed by the Festival Orchestra conducted by Andrew Parrott, with stage direction, baroque gesture and choreography by the Belgian specialist Sigrid T’Hooft, scenery and costumes by Stephan Dietrich and lighting by Heinz Kasper. The singers in this opera for high voices only were Mareike Braun, mezzo, as Amadigi, Stefanie True, soprano, as his beloved Oriana, Judith Gauthier, soprano, as the sorceress Melissa and Markéta Cuvrová, soprano as Amadigi’s friend and enemy Dardano. They were joined at the end of the last act by the soprano Johanna Neß, as the magus ex machina Orgando. The dance troupe was Corpo Barocco. The curtain remained closed during the overture, signalling that the present-day rage for action at all times would not be catered to – at least not yet. The scenery, when the curtain rose, consisted of three plain blue-grey curtains, with diminishing arches cut out in the middle. On either side were pillars, vegetable or mineral. Too slender to be architectural, they may have been trees, trimmed by magic into peculiar shapes. One may expect curious matter in a sorceress’s garden, but this decor returned in later scenes. The eight scene changes in the word-book were reduced to the rise and fall of yet another plain drop curtain; Melissa’s garden, the enchanted porch, the palace garden, the great hall and the cave, there was little difference between them. The floor was painted to look like broad planks, the way an 18th-century stage floor looked, except for the blueish colour. It was also full of traps, necessary attributes seldom found in a modern stage, for the infernal spirits to rise from, together with a set of baroque vases, but not the statues mentioned in the stage directions. 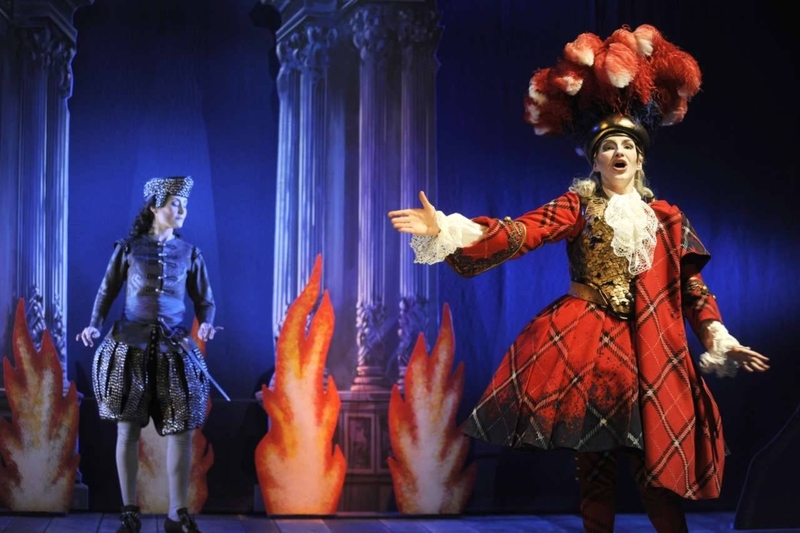 The scenery and costumes were mainly in primary colours, probably to make the relationship between the characters – surprisingly clear for Handel – obvious to the audience. Amadigi is mainly dressed in a red tartan to show that he was adopted by a Scottish nobleman, a detail from one of the many books about Amadis/Amadigi. Oriana, daughter to a king, wears yellow with red details, perhaps to suggest that she will choose Amadigi over the silver Dardano? Melissa wears blue, again with red details as she too loves Amadigi. Amadigi’s red plaid costume has golden, but no yellow elements. Doesn’t he really love Oriana? Maybe it is too far-fetched to search for a meaning behind all this and the primary colours are just a way to stylize the stage picture, which as a result looks rather un-baroque, as does the use of blue as a dominant colour. Blue was not a favoured baroque colour, as it looked green in candlelight. The chandeliers with fake candles we have seen during efforts at baroque staging in this theatre over the past twenty years were not used, nor was any of what by now must be a considerable collection of baroque costumes and scenery. An eighteenth-century company could never have afforded this, nor should it happen today when shortcomings are routinely ascribed to financial problems. The demons wear Melissa’s colours, with marvellous headdresses and fury appendages such as snakes or flames. Amadigi’s headdress is a golden circlet with large red plumes. Dardano, though a prince (of Thrace) has a much simpler renaissance-inspired headdress, silver like the rest of his costume and Oriana a kind of triple mitre. The baroque convention that the headdress with plumes tells us the status of the character is ignored. The magus Orgando wears an oversized chef’s hat, suggesting perhaps that he was too busy in the kitchen when his help would have been very welcome? He is Oriana’s uncle, but doesn’t turn up till after Melissa’s death. It is Handel’s librettist, presumably Haym, we have to blame for this absurdity. We had been warned that there wasn’t really to be a historically informed stage picture. In the interview in the programme, Sigrid T’Hooft says that reconstruction doesn’t make much sense, because it would be insufficiently expressive. This from a woman who gave us a splendid period staging of J. C. Bach’s Zanaïde at the Goethe Theatre in Bad Lauchstädt only last year. If it doesn’t make much sense, why put a baroque orchestra in the pit that Handel would have sold his soul for? Why her wonderful baroque dancers, and more effort than ever before put into baroque gesture? One of the real causes can be found in the next paragraph: baroque scenery is handmade and therefore costly. There may be another reason, not mentioned for obvious reasons: the designer’s wish to be distinctive. Stephan Dietrich has worked with Sigrid T’Hooft before; he designed the costumes for Radamisto in Karlsruhe in 2009. There were modern elements in those costumes as well. The scenery was however by Christian Floeren, who had more respect for eighteenth-century theatre tradition. This set was not his; Dietrich designed both costumes and scenery. In the interview, T’Hooft says that there are no real scene changes in this production, the magic lies in the architectonic elements: the burning tower and the playing fountain. These, however, are disappointing. Theatre designers seem to have forgotten how simply spectacular theatrical effects used to be achieved. Without a bag of electronic tricks they are soon out of their depth. The ‘porch in flames’ blocking the way to Oriane’s tower in the word-book has been reduced to two rather small pieces of jigsawed scenery representing groups of pillars fronted by cut out flames. The tower in which Melissa keeps Oriane imprisoned is missing. The Fountain of True Love, special enough in 1715 to be mentioned in the advertisement and used again that same month for a revival of Rinaldo, here looks more like a Christmas tree hung with silver garlands and no moving parts. Amadigi sees Oriana with his friend Dardano behind the garlands and faints dead away. Later, Amadigi kills Dardano, who towards the end returns on a cloud. He should of course have come back from below, as he tells Melissa her words got through to him in hell. His cloud is an enlarged engraving rather than a painted cloud, so it has no colour. Obviously the red-blue-yellow concept takes priority over baroque theatre tradition. Musically the performance is of the highest quality, as usual at the Göttingen festival. The festival orchestra under Andrew Parrott is superb. The vocal soloists are all good, but Melissa gets most of the ovations, mainly due to the vocal fireworks with which Handel provides her. As for the dance, it is to be deplored that the London stage of the time offered less scope for it than did that of France. Still, it was a bit disconcerting to have dancers in the background during an aria. As far as gesture is concerned, this production has been a major step forward. The pictorial part remains the problem. The reasons she offers for this are in contrast to what Sigrid T’Hooft does in her own field, where she utilises fully the expressiveness of the baroque stage. As soon as she gets off her own territory, however, she allows a completely different approach, which is exactly what musicians have been doing for years now. This, far more than the perennial lack of money, is the fundamental problem with regard to present day baroque opera productions: the tendency of specialists who say and do sensible things in their own field, to stand calmly by while others undermine the unity of their productions. In the interview Laurence Cummings gave Die Zeit before this festival opened, he said that historically informed productions would not be the norm while he is artistic director. He stated that he had had good experiences with modern productions too, citing the Messiah he did with Deborah Warner. ’Nuff said. Picture credit: Teodoro da Silva.